We did not always use recipes when I was growing up. For main dishes, more often than not my mother followed a recipe, but with sides we always pretty much winged it. Most likely, a recipe was used originally, and then the dish was re-created from memory. I do remember a spinach dish for which my mother had found a recipe that involved eggs, sour cream and the oven, which morphed into a stove-top concoction of spinach, eggs, cottage cheese and dried minced onion (a staple in our kitchen). 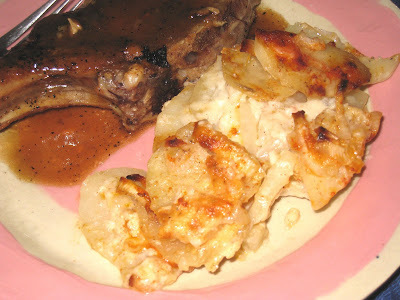 I had all but forgotten about scalloped potatoes until recently. I don't remember ever having a recipe for those. You just peeled and thinly sliced some potatoes and an onion, layered them out in a shallow baking dish, seasoned with salt (no pepper in our kitchen! ), dotted them with margarine (no butter in our kitchen! ), sprinkled them with a tablespoon or so of flour, poured in some milk, sprinkled the whole thing with paprika, covered the pan, and baked it in the oven until the potatoes were nice and tender. It was delicious and so easy to prepare. I don't know why I forgot about them. Or why I remembered them for that matter. Maybe it's because russet potatoes have been on sale for a ridiculously cheap price at the grocery store and I have been buying them frequently, and there are only so many hash browns I can make in a short period of time. Maybe it's the center-cut pork chops I wanted to braise in Shiner Bock beer that were just begging for some potatoes on the side. Maybe it's the cooler weather. Whatever it was, I'm grateful. These are just as easy to make as I remembered, and they're soft and creamy and go extremely well with any form of meat. I guess I really am just a meat and potatoes gal at heart. Preheat the oven to 375 deg. F. Peel and thinly slice 3 to 4 medium-sized russet potatoes. Peel the outer layer off of a medium onion, then cut it in half and thinly slice it. Grease an 8 x 8" baking dish. Layer half of the potatoes and onions on the bottom of the dish. Season with salt and pepper. Sprinkle about 2 tablespoons of flour over the potatoes and onions, and then dot it with about 2 tablespoons of butter. Cover with the remaining potatoes and onions and season with more salt and pepper. Add about a cup of milk (to come up to about half the height of the potatoes). Sprinkle with a teaspoon or so of paprika (sweet smoked Spanish paprika works really well here). Cover with aluminum foil and bake for 45 minutes. Remove foil and cook for another 20 to 30 minutes, until the top is browned and the potatoes are tender.